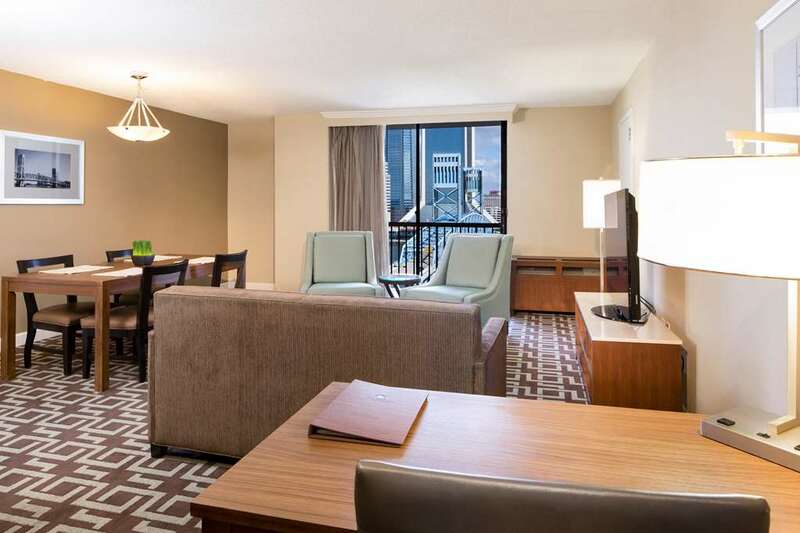 Centrally located on the downtown riverfront DoubleTree by Hilton Hotel Jacksonville Riverfront is set amidst the historic San Marco district near EverBank Field and The Jacksonville Landing. Stay connected in the 24-hour business center and plan a meeting training event or wedding for up to 500 guests at this Jacksonville FL hotel with 12 000 sq. ft. event space including a riverside terrace and a ballroom. Take advantage of state-of-the-art A/V equipment and creative catering to ensure your function is seamless and professional. Admire beautiful views over the river from the balcony of your guest room or suite. Check emails with complimentary WiFi and browse premium channels on the flat-panel HDTV. Spacious Junior Suites are also available at this downtown Jacksonville hotel featuring a microwave a mini-fridge and a sleeper sofa. Dine in style at Ruth*s Chris Steak House. Select your favorite cut of beef to savor alongside signature sides and a bottle of fine wine from the extensive list. Begin your day with a southern-style buffet breakfast in The American Grill or recharge with a coffee in the Starbucks Coffee Bar. Start an exciting night out with signature cocktails in the chic Lobby Lounge. Work out in the 24-hour fitness center enjoy wonderful views from a pool deck lounger or soak up the sunshine as you refresh with a swim. Our friendly staff look forward to greeting you on arrival with a signature warm chocolate chip cookie. Ruth*s Chris Steak House: Enjoy steak lobster or fish while taking in the view of the St. John*s River at our downtown Jacksonville restaurant. Ruth*s Chris Steak House is always a memorable dining experience. St. Johns Provision Co.: Enjoy casual Jacksonville dining and fast friendly service morning noon and night in the St. Johns Provision Co. restaurant. You can enjoy a fabulous southern breakfast buffet and seasonal lunch and dinner menus which include eclectic selections infused with a regional inspiration.